is only an app away. Introducing Service Wave Analytics, the app that delivers a new level of customer service insight to any device. Now service leaders can get instant updates on team performance, key metrics, and trends across all channels. And agents can instantly access relevant customer and case data, so they can deliver the right service on the right channel at the right time. 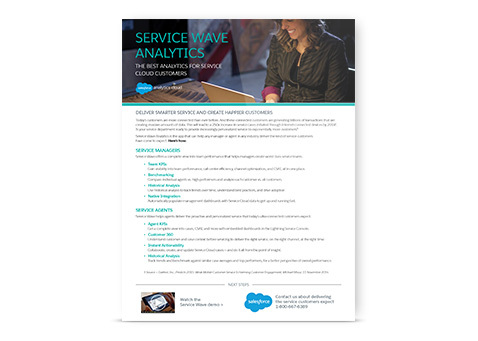 Download this one page overview of Service Wave and find out how your whole team can start turning Service Cloud data into smarter customer service.